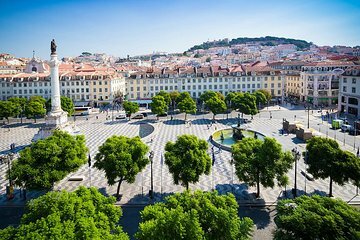 Meet your group and expert local guide at Rossio Square for your Lisbon guided walking tour. After a brief introduction, learn how this 19th century historical square was built with typical calcada Portuguesa stones to resemble waves of the nearby ocean. From here, follow your guide to Restauradores Square and see an obelisk rise towards the sky, exemplifying Portugal’s ascent to independence from Spain in 1640. Continue your Lisbon city walk to Liberdade Avenue, where you can observe Portuguese art deco architecture like the 18th-century Foz Palace and the Eden Theatre. Nearby, visit the Rossio Central Station and listen as a train heads into the 1.61-mile (2.6 km) tunnel towards Sintra. Hear how this 19th century engineering marvel was built and stands as one of Portugal’s most impressive accomplishments. 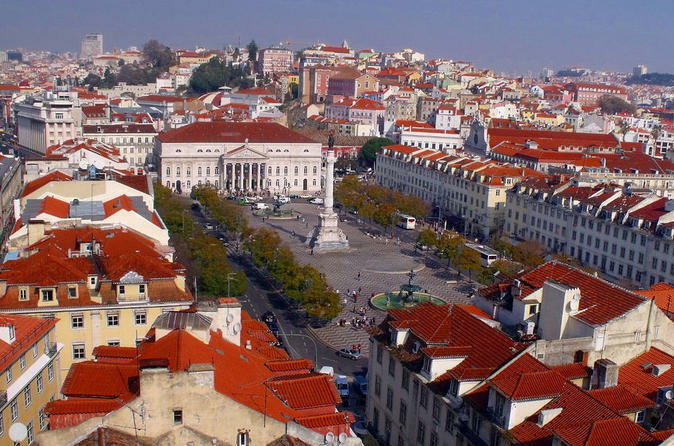 Next, head to historic Carmo Square, home of the 1974 Carnation Revolution. Here, learn how Portugal’s previous dictatorial regime collapsed after a 48-year rule. Stroll onward to reach the charming Chiado neighborhood full of boutiques, theaters, bookstores and vintage cafés. Explore this chic quarter while stopping for a coffee (own expense) or popping into a store for a peruse the souvenirs. Shortly thereafter, rendezvous with your guide for a fun ride on Lisbon’s classic tram. Hop off at Alfama, an old quarter, known for its Moorish heritage and the establishment of Fado. Learn about Portugal’s melancholic music as you walk by Fado restaurants tucked in between alleys and winding streets. Finally, arrive at Lisbon’s oldest cathedral, Sé de Lisboa. Snap some beautiful photos and then walk to the your last stop, the majestic Commerce Square (Praça do Comércio). Hear how the reception hall was used to welcome travelers arriving from the Atlantic, before your tour concludes and you continue exploring on your own. Sophie was very knowledgeable and friendly. We took this tour at the start of our visit to Lisbon so that we would get an overview of the city. Our guide Pedro was superb. He was friendly and full of knowledgeable enthusiasm for his home city. We were given a clear history of the area and major events which have shaped its development. A Portugese tart, cheese, ham and a drink were included making the whole thing not just very entertaining but great value for money. We would thoroughly recommend this tour. This was an excellent walking tour of Lisbon. There is so much to see and we saw a lot in the time we had. Our guide, Sophia, was excellent and kept the group moving despite a late start due to one person arriving late. The tour includes some tasty Lisbon cuisine. A great way to experience Lisbon and determine where you want to spend more time. I enjoyed the tour and the guide Sophia was very friendly and knowledgeable. The only reason I gave only 4 stars instead of 5 was because it was too long for me to walk on cobblestone streets with out anywhere to rest. I realize it was a walking tour but it would have been nice if when we stopped for the guide to speak that there might have been a couple places to sit for a little while while she was talking. Our tour guide Helder was amazing!! Very informative with plenty of details, dates, facts about the country's history and knowledgeable. We walked for several hours in central Lisbon, the neighborhood of Alfama, as Helder described what we were seeing. Try to get him if you can!! Well worth it. This was a very enjoyable experience. Our guide, Rossanna, is not native to irrigate bit was very knowledgeable and insightful. The tour included a couple of stops along the way for treats too! Worth the time! Our tour guide was great. Joanna was a great guide! She shared with us some local secrets to getting around and finding delicious local foods. This tour was amazing. Informative, well paced, scenic, and educational. We loved learning about the city’s history and get to know more about the culture. Our guide, Joana, (who works for an affiliated company w Viator), was superb. She was knowledgeable, enthusiastic, lively, and so passionate about the town. She loves her job, it she’s, and it made the experience one that will be memorable. This was one of the best tours we’ve ever been on, and highly recommend it!